BANKY W AND TOOLZ IN LOVE? 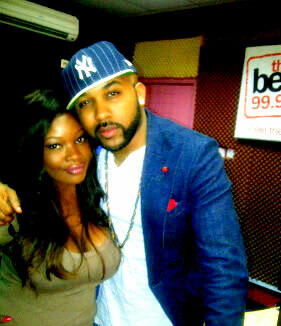 What is really going on between R n B singer, Banky W and Tolu ‘Toolz’ Oniru, the Beat 99.9FM presenter? The duo have been sighted together a number of times at different shows. Many people noticed Toolz’s visibility at EME’s baddest concert that held yesterday, Friday 21st of December,2012 at the Grounds, Ocean View restaurant in Victoria Island, Lagos. She was so involved during the show. Our eagle eyed gist merchants informed us that Banky and Toolz were all over themselves suggesting there was more to their closeness. Though some close friends of Banky W were quick to douse the rumour claiming that there was nothing to their closeness as it was purely for business but those who saw them together at some other events before the one of yesterday swear it was more than a mere business relationship. Though the bond seems to be strong, Banky W, EME’s record boss, is already known as a musician who loves to break hearts of top divas in the Nigerian entertainment industry.